Last week, Olivia wrote about how being "not Ray Shero's front office" wasn't enough for Jim Rutherford, and while she focused more on injuries and the organizational mindset of not fully protecting players from returning to action before they should medically, it does underscore the point that while the man in charge has changed, there's really a lot of similarities between both the former and current General Manager of the Pittsburgh Penguins. 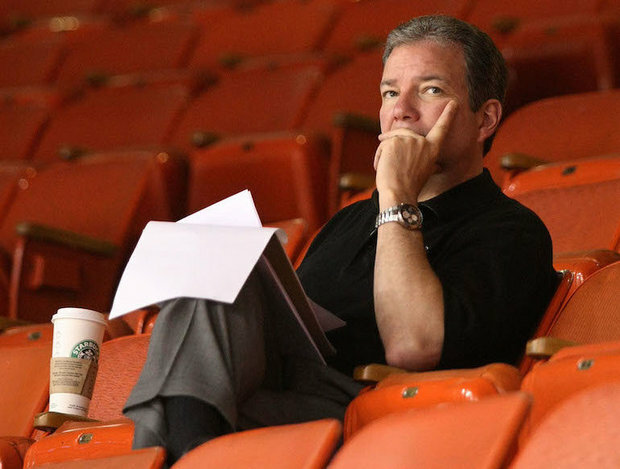 Ray Shero's tenure in Pittsburgh made an abrupt 180 degree turn in a short period of time. He was named the 2012-13 General Manager of the Year before being fired at the start of the 2014 offseason. The fanbase went from "In Shero We Trust" to calling for his head, with 3 failures commonly repeated: 1) he re-signed Rob Scuderi to a contract that was too big and too long; 2) the two 2nd round draft picks that he gave up for Douglas Murray marked a huge overpayment for an anchor who would weigh down their defense; and 3) he had a horrible track record in the draft. While the first two both undoubtedly happened and were mistakes, the irony is that not much has changed on those fronts; Jim Rutherford has been prone both to mistakes with the salary cap and mismanagement of assets. But how well does the third point actually hold up? Past the 1st Round, the draft essentially turns into a crapshoot. While Shero's propensity to trade draft picks lowered the number of lottery tickets the team had, it didn't lower the chances for success for the picks the team did make. Shero and the scouting department identified the players, but it's player development that played arguably the biggest role in getting players to the NHL level. That's where Tom Fitzgerald comes in. Fitzgerald was originally hired into the organization in 2007 as the Director of Player Development before being promoted to Assistant to the General Manager in 2009, a position he would hold until Ray Shero's firing in 2014. Fitzgerald would continue to oversee the team's prospect pool from his new role, and he was responsible for working with the players to improve their games. Between 2007-14, only Jordan Staal (2006 1st), Dustin Jeffrey (2007 6th), and Brian Strait (2006 3rd) played in over 100 NHL games among Shero draft picks who signed in Pittsburgh; Jake Muzzin (2007 5th) also topped the 100 game mark during that time frame, but he never signed with the Penguins organization. Staal bypassed the farm system completely, Jeffrey has been super-productive at the AHL level but could never put it together in the NHL, and Strait has had a largely forgettable career with the New York Islanders after being claimed on waivers. Some players had also begun their NHL careers during that time frame and have since topped 100 games in the NHL: Simon Despres (2009 1st; 85 GP), Olli Maatta (2012 1st; 78 GP), Robert Bortuzzo (2007 3rd; 75 GP), and Beau Bennett (2010 1st; 47 GP). Like Staal, Maatta bypassed the organization's farm system entirely. Both Despres and Bennett have generated criticisms over the way their development was handled, and Bortuzzo made his mark as a tough defenseman who can drop the gloves but has provided little beyond that. By far the most successful NHL players (Staal, Muzzin, Maatta) weren't subjected to the Pens' player development program under Fitzgerald, next on the list (Despres, Bennett) were both 1st round picks who arguably had their growth stunted under Fitzgerald's watch, and the others never made it past replaceable bottom of the lineup type players. But a funny thing began happening once Fitzgerald was promoted out of his player development role in 2014: the prospect pool started thriving. Tom Kuhnhackl (2010 4th) bounced between Wilkes-Barre and Wheeling from 2012-14 and didn't play particularly well during that time frame either. However, starting with the 2014-15 season, Kuhnhackl began to turn things around: he scored 30 points in 72 games with the Baby Pens after managing just 14 in his 59 AHL games over the previous two seasons, and after 15 points in 23 games this season with WBS he was called up to Pittsburgh and has flashed some sneaky playmaking skills with 9 points in 32 GP. Bryan Rust (2010 3rd) didn't join the organization until the very tail end of the 2013-14 season, and like Kuhnhackl he's also found a place in Pittsburgh's bottom 6 down the stretch run, and he has 10 points in 37 games on the season. Scott Wilson (2011 7th) followed a similar path as Rust, signing his ELC very late in the 2013-14 season before fully joining the organization in 2014-15. After showing good goal scoring ability in the AHL, he's gotten his chance with Pittsburgh and has seen some limited time on Sidney Crosby's wing and the 1st power play unit. He had 5 goals and 1 assist through 24 games before going down with an injury, but he also kept his head above water in the possession game relative to his teammates with a 55.2 SACF%. All 3 players were recently signed to 1-way contracts based on their NHL play and potential. Brian Dumoulin was actually drafted by Jim Rutherford, not Ray Shero, but it was Shero who signed him to his ELC after obtaining him in the Staal trade. Despite being hailed as a fairly NHL ready defenseman, during his first two AHL seasons, from 2012-14, Dumoulin didn't have the type of success that was expected from him, and his career path looked like it would peak at a fringe bottom pairing level. But things began to change starting with the 2014-15 season. His points per game significantly jumped (0.53 vs 0.36 the previous two years), and while +/- is a poor stat to use, it's perhaps the best proxy for possession at the AHL level, and Dumoulin went from a -9 from 2012-14 to a +18 in 2014-15, and Dumoulin has been one of the biggest surprises of the Pens' season this year, with 16 assists and a 53.1 SACF%. Conor Sheary is another player who, while not drafted by Shero, signed his ELC with the Penguins under the former GM at the tail end of the 2013-14 season. He's shown great offensive production with the Baby Penguins, and he's had a mostly regular place in the lineup for the Penguins, posting 7 points in 34 games while also being a great driver of possession with a 57.5 SACF%. Matt Murray (2012 3rd) was another player who joined the Baby Pens just before the end of the regular season, and he's exceed even the most wildly optimistic of expectation with his play. Starting with the 2014-15 season, Murray has posted a 0.932 SV% and 1.81 GAA with Wilkes-Barre, and he's been even better in limited NHL action with a 0.935 SV% and 1.85 GAA through 7 starts. Oskar Sundqvist (2012 3rd) has gotten a handful of games in the NHL during his first season in North America, and the team remains bullish on his NHL potential. And while he was a Rutherford draft choice, Dominik Simon (2015 5th) has been tearing up the AHL in his first season in North America. So, what does this all mean, that a Pittsburgh organization that struggled to develop viable NHL players for 7 years suddenly has an influx of players who look like they'll hit the 100 game mark in the NHL? If Shero is going to bear the brunt of the blame for the prospects earlier in his tenure with Pittsburgh, that would mean he should get the lion's share of the credit for the suddenly viable prospect pool the Pens are left with today, but how much of that is fair or warranted? How much falls on Tom Fitzgerald's shoulders? Is it just a coincidence that the top of the prospect pool has either found great success or made a large turnaround since Fitzgerald was promoted to Assistant General Manager, or was he actively hurting the development of the players he oversaw and they improved because of his absence? If the latter, Shero isn't entirely absolved, as he controlled his staff, but the recent results certainly shed a new light on Shero's drafts as the Pittsburgh Penguins GM, and the certainly question the competency of Tom Fitzgerald in a player development role.